How Fed Up Are You? Snack Girl didn’t want to touch reviewing this film with a ten-foot pole. But, I keep getting asked about it so here I go. Ummm. It is really hard to be me and watch this film because I have read all the background – I have studied the work of all the “talking heads”, mostly white men, that populate the film. The problem is clear. We have an obesity epidemic and it has lasted 30 years. It is a public health crisis. In 2009, I was motivated by this crisis to start Snack-Girl.com and help people find alternatives to junk food. Who is to blame for our crisis? In the film the bad guys are the corporations who create crappy food that is addictive and the government who doesn’t regulate junk food and feeds our kids junk at school lunch. I believe the film-makers want us to get Fed Up and get Congress to act. On Snack Girl, I stay far away from discussing politics because this site is a source for healthy eating inspiration, not a place to share or argue political views. So, I am not going to side with the film-makers and say this idea makes sense (or not). They also want us to take a 10 day challenge to avoid added sugar - which I think it is a good idea. I would try one day first, though, and see how you do. Once you realize how many of the foods you eat have added sugar, you can start making your own (like salad dressing). What I will say, is that having Michael Pollan (who sits on a hill in Berkeley, CA) tell us one more time that we need to cook is unnecessary. We know we need to cook, and eat whole foods, and stop eating processed crap. The documentary could have helped by finding people who made the shift and having them talk about how their lives changed. This film profiles a couple of overweight teenagers and it breaks my heart to see kids unable to change their weight. But I left wondering why there wasn’t a registered dietician involved with their families. Was there no one who could help these kids? Why would the filmmakers not try to help them? Why not fly Michael Pollan over so he could feed them some arugula? I believe a better film would have framed the problem and then given a raft of solutions to help individuals and communities eat healthier. It seems superficial to ask us to quit sugar for 10 days instead of talking about all the people, programs, and communities involved in changing things (even incrementally). My favorite documentary on food is Super Size Me directed by and starring Morgan Spurlock. He eats at McDonald’s for 30 days and talks about fast food in such a way that made me never want to eat it again. Did you see Fed Up? What did you think? I fully agree with you, Lisa. I haven't see Fed Up , but I have seen Super Size Me and Food Inc. I always enjoy your blog. I agree about the easily accessible processed food. But we have other economic issues driving obesity: lack of leisure time to get exercise (because we all have to work so much more than we did 30 years ago), and the high cost of living coupled with flat wages which makes the cost of produce, whole grains and lean proteins pretty high for most families. I don't really want to see this, either. From what I gathered from reviews and interviews, it's a well meaning documentary that blames the health crisis on obesity, when in reality obesity is just one symptom of a huge problem. I also didn't like how Katie Couric in interviews brushed away the problem of poverty by saying cooked food costs less. Well sure it does, in money. Time? Not as affordable when you're supporting a family by yourself. Especially when you consider the poorest Americans don't work shifts within your standard 9-5. Again, the intentions are good, but I think we need to shift our understanding of both obesity and the cost of food. Definitely love that they call the government out for being in th e pocket of big food, though. Thank you, Thank you! It's difficult to find people who are like minded, so when I read your review I felt 'at home'. I've dropped 50% of my body weight and I'm on a mission to help others... it's very challenging on your own when people are fascinated and inspired by you, but get 'fed up' with trying to be on board. Helping people find value in what they have not experienced, that which takes time to experience, is very difficult. My impression of Fed-Up? If the producers/creators of the film really wanted to illicit change they would have done JUST as you said! They would have shown success, how, and why along with struggle. There is a ton of influence research available to the professionals who are pure of heart and motive. They may have wanted to hightlight the problem, yet again, but they don't want to illicit a cure for America. Did anyone see this by T. Colin Campbell? Visit his site to see full article. I did see the documentary and thought it was well thought out, and presented the issue as it is. Obesity is an epidemic as is adolescent diabetes. We have a serious problem and it all starts with our food supply. Why is it that "cheap" food is processed to death and has loads of Sugar and Chemicals in it that are harmful to our health, our planet, and especially our children. Good, wholesome food should be "cheap" while processed, bad for us food should cost a premium like it does in most other countries. Yes we do need more exercise, but this is not the whole issue. As in the movie, these kids were exercising more that I do every day and gaining weight. It wasn't that they weren't active enough, it was the food they were easting. We have been told for 30 years Calories in equals Calories out and exercise is the key. After watching this, I believe we have been fed a line of bull for the last 30 years. Yes we need exercise, yes we need good, whole foods. ALL of us. I don't want to get political either, but unfortunately, this is where the problem stems from. Lobbyist do not belong in the FDA, or the USDA, or any other food organization the federal government has. Lobbyist should not be deciding what is served to our kids at school. Lobbyist should not be dictating standards in our food supply, but they do. And have since before I was born in the 70's. I love your Blog Lisa and am glad that you decided to mention this, even if from a standing back approach. The more people are aware and the more we educate ourselves, the better we all will be. I so agree about super size me.amazing evidence! Unfortunately people still don't get it. I work as a healthcare professional and most people in my department haven't a clue or just severe deniel.Thank you Lisa for all that you do. I look forward to your blog. Totally agree with your assessment Lisa. People will always be ready to lay blame (which is totally justified at times), but let's look at the big picture and what effective steps we can take to move forward...this is not as simple as "sugar". It is a multi-dimensional health problem that is effected by MANY things. Our food supply is an issue, no doubt, but there are so many other issues at hand as well. And thank you for asking why these teenagers didn't have an RD involved with their families. This is how I spend my day...trying to help my patients navigate a very difficult environment and make the best choices they can where they live and with the resources they have. This is very challenging! 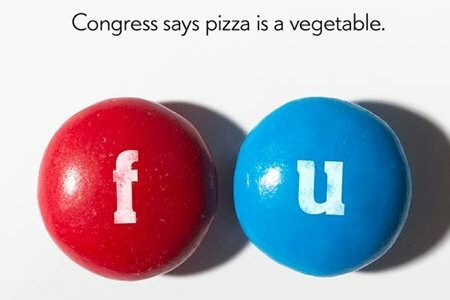 "Congress says pizza is a vegetable". They must have the NSA watching me cook. I use a very thin crust (almost a tortilla), some olive oil, fresh garlic, red onion, fresh mushrooms, some bell peppers, baby spinach, cherry tomatoes or thin slices of beefsteak tomatoes, a few olives (the only thing from a can or jar here) and some thinly sliced swiss cheese. Yeah. It is as good as it sounds! Keep bringing the good words, Lisa! You are powerful in your reach! Thanks for helping us think about this problem! I did see the movie and thought it was good. However I agree with you that it should have done something to help the kids as well as give everyone advise on what to eat as alternatives to sugar foods. It's much more than the schools who are contributing to the kids weight. The parents buy the food and they need to change more than the schools. I just want to share my personal experience. I have been obese my whole life. 6 months ago I joined a weight loss program ($49 a month), and have been eating healthy foods (fresh fruit & veggies, whole grains, ect...). I have lost 25lbs and am very happy ( of course! Lol). But here's the issue, I am on a low income so money has to really stretch. Fresh produce and all the other "good for you" food is really costly. I choose to make the sacrifice for my healthy sake BUT I don't have a large family to feed. It's not just regulations that need to be made by the government but we need to help low income families have access to affordable healthy choices. Pre-packaged foods and fast foods tend to be more affordable and time efficient to busy, money strapped families. My grocery bill has doubled since I changed my diet. I live in Canada and our summer is very short. We don't have garden centres to go to ,to buy local produce year round. We have farmers markets in the summer and fall but I have found that their produce is as expensive and sometimes more so than in the store. So it's not just about cracking down on industries but also programming to insure all people have the ability to make those healthy choices. People have grown bigger since WW2. Why? Food has been processed so we don't need to cook and also it can be stored for longer periods. In the 1950's, the UK is behind the USA, hardly anyone had fridges let alone freezers so housewives, women did not often work, would do housework for 3 hours a day, walk for an hour a day and cook for at least an hour. Snacks are a new phenomenon and so were not part of the diet. Breakfast was about 180 cals, lunch around 440 and dinner about 1,000. Better nutrition and poorer food has made us fat. Grazing was unknown . I guess that choice of so much food has made us greedy so we eat more and make bad choices, helped by the manufacturers! You should watch the documentary "Fat, Sick, and Nearly Dead". It follows one man who went on a juicing diet and completely eliminated processed foods from his diet. He did it to improve his own health. While juicing is too expensive for me personally, and I do fruit/veggies smoothies instead, the message he sends is a good one. We are diabetic and I have been saying that if people would change over to a diabetic lifestlyle there would be more healthy individuals. Otherwise it can mean stroke, heart disease, mancular degeneration (blindness), kidney failure, fatty liver disease, high blood pressure, and even non traumatic amputations. Most of us look healthy,but it is a progressive disease. We try to slow or stop progression. Many things can trigger diabetes. Genetics, environment(use of pesticides and pollutants), illness, medications, and other reasons. When pregnant women have gestational diabetes, it is likely that they and their child may have diabetes in the future. greater risk for obesity and type 2 diabetes." There are a lot of obese people who do not have may never have it. However, they may be putting themselves at risk for this other diseases. Losing weight is very helpful for diabetics because it helps to control the disease and puts less stress on the pancreas and other organs. Ask your doctor about the risk of certain medications triggering diabetes. If you overeat, you are taxing your pancreas and there is no way of knowing that you have worn it out until you have diabetes. Fatty liver disease may occur even if you drink little or no alcohol and are diabetic. Therefore, now is the time to stop eating fatty foods and getting foods that don't raise your LDL or bad cholesterol and triglycerides. I am not sure anyone is listening. It is not a disease of the overweight. Type 1 diabetes is prevelant in our youth and even atheletes or those who are physically fit. Type 1 diabetes cannot be controlled with diet but can be harmed or helped by it and requires more use of insulin and other diabetic medications to control. Type 2 diabetes can be better controlled with diet and a person may not need insulin right away but may use oral medications. Constant testing of one's blood sugar is the most important thing. If the blood sugar goes too low, one can have seizures and go into a coma. If it goes too high, ketoacidosis (diabetic coma) may occur and the individual may die. I suggest everyone buy a glucose meter and check their blood sugar often and show this to your doctor and ask how it is affecting your health and how you can help to possibly avoid diabetes or prediabetes. Start now and maybe you won't get this disease. To everyone who states that healthy food is MORE expensive than junk food....BALONEY!!! Last time I bought a bad of chips for a cookout (by request) it was over $4.00; I could have made a healthy potato salad with that $4.00. Fruit is cheaper than all those sugary snacks parents buy for their kids. I can make a large green salad (not iceberg lettuce either) with carrots, cucumbers, tomatoes, etc that's cheaper than those processed side dishes you buy in a box. No time for exercising? How much TV do you watch? Even if you only watch 30 min of TV a day that's enough time to work out. We make time for what we WANT to do, now let's make time for what we NEED to do. Did anyone read the article that T Campbell wrote? I was more interested in the responses of the people! Very insightful...read the responses. Are food companies at fault? Maybe. Do we owe the entire obesity epidemic on them? Absolutely not. Food companies listen to consumers, they make food what we want it to be. How do you think this whole "gluten free" nonsense got started? Consumers expressed the desire for gluten free labeling, the companies knew this would sell and started revamping their labels. The FDA didn't ask for that. Instead of blaming the companies (I'm not saying they're innocent) we should try to work with them. We need to be verbal about what we want, and not just to congress. Congress can spew out regulations but this costs money and time where we really need to be worried about the national debt (HELLO!!). Where are the largest issues with obesity? Impoverished areas. We need to hone our focus here. Stop focusing all the financial breaks on corn production... this is what needs to happen. And I used to think eating healthy was just as cost effective as junk food but it's not the case. If you want to live on dried rice and beans, sure, that works. If you're living below the poverty line you're looking at $1.20 PER DAY to feed yourself. That's enough for a bag of frozen cauliflower at my local store. This simply won't buy you all the fruits and vegetables you need AND meet your caloric requirements. Some junk foods like chips are wildly expensive, but frozen pizzas can be as cheap as $1 and feed a few. I shop sale ads, always, and when I buy produce my bill is higher. I'm okay with this, I'm willing to spend extra to eat healthy. Others don't have that same choice. Food pantries rely on donations from stores and food drives. Most of these items are canned with sugar added (heavy syrup fruits), sweets from the bakery (this is what happens to items that are "baked fresh daily"- they head to the pantry after, or canned meals like spaghetti-o's. I work at the food pantries. We give families 3 or 4 boxes of sweets (I'm talking whole sheet cakes) and yet they leave with two bags of vegetables... salad bags with 4 servings each. It's a horrible imbalance. The irony? So many of them come in talking about trying to manage their diabetes as we pack sweets into their car. It makes me sick. Even worse still are the cars that come and we have to find places to put their pantry donations around the boxes of soda cans. I've seen a little 4 year old girl gulping down a Dr. Pepper while her mom shopped from the food pantry. We eat pretty clean at my house. I make most everything from scratch but we can do better. I tried to swap out grains for produce a few weeks ago. So instead of a tortilla we used lettuce. Instead of bread we used cucumbers. (etc.) Well, my grocery budget doubled. Doubled! Don't "BALONEY!!!" me. A bag of chips (where I live) costs about $2.50. Grapes are closer to $3 a pound. Apples are close to $3 a pound. Now, I rarely buy chips, but when I do, the bag lasts my family of 7 through more than one sitting. A bag of grapes (consisting of 2+pounds) is gone in one meal. I know which one is better for us. However sometimes the budget wins. It DOES cost more to eat whole foods. Yes we are a fat nation... But look at what sells... A box of sugar chemical charged cereals ... Or a platter of veggies? I saw the movie and it resounded with me. It opened my eyes to how hard it is to lobby for better nutritional guidelines, school lunch rules, etc. with processed food companies lobbying for their interests. I agree that the stories of the families shown was heartbreaking.